Put cucumber slices in a small bowl. Add lemon juice and olive oil. Mix together. 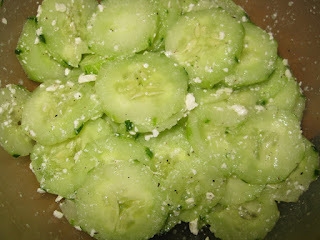 Sprinkle with feta cheese and mix again. Add salt and pepper to taste. Cucumbers grow so fast and they will get too big if you don't check on them often. Every day I remind my husband to pick the cucumbers and every day he tells me he picked them all. I think he forgot this one!